How to get import licence in Nigeria? 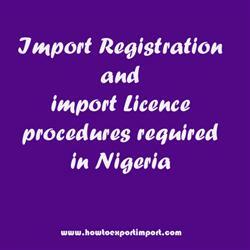 What are the procedures for registration as an importer in Nigeria? How to get the status of an importer in Nigeria? How to start an import business in Nigeria? What are the certification formalities to import to Nigeria? This post explains about import registration procedures to be obtained from Nigeria government authority for importation to Nigeria. If you need to import goods or services, a onetime registration procedure is being completed in most of the countries. Such import export licence may be obtained from concerned government department of Nigeria if required. a) Should register the company name in Nigeria or hence have a certificate of Incorporation. b) Register the company with the Federal Inland Revenue Services (FIRS) and get Tax Identification Number (TIN Number) upon the proof of tax payments. c) Take an account in any Bank of choice in Nigeria. This Bank will then process the Form M / PAAR, as well as mediate among the Nigeria Customs Service (NCS), the importer and other bodies. e-Form “M”:- An e-Form “M” is a mandatory documentation process required by the Federal Government of Nigeria and it processes through the Federal Ministry of Finance and the Central Bank of Nigeria, to monitor and keep track of the goods that are being imported into Nigeria and facilitate the payment of import duties. d) Obtain regulatory certificates like SONCAP (Standards Organization of Nigeria Conformity Assessment Program) or NAFDAC as the case may be for items that are regulated. Subsequent to finishing the above procedures, you should register as an importer and client of the Nigeria Single Window Trade Portal on the FIRS site. The Single Window Trade Portal is an intergovernmental site that encourages the trade procedure by enabling Nigerian and international parties to get to Nigerian governmental services. Usually, import of goods to Nigeria requires three categories of procedures wherever required. One-time registration procedures to act as an Importer in Nigeria, Specific import licence to import goods to Nigeria if applicable, and certain certification like SONCAP or NAFDAC or others from concerned government agencies of Nigeria related to each import wherever applicable. This information is about import licensing procedures to import goods to Nigeria. If you have to add more information about import permit and registration required to import goods to Nigeria, share below your thoughts. How to get import licence in Asaba, Delta. Procedure to get registration to import in Abuja. Mandatory process need to complete import in PORT HARCOURT . First permission required to import in Kano. How can I start import business Lagos? How to begin import trade in LAGOS? Permission to initiate to import in APAPA. The way to get registration to import in Sokoto. Import registration procedures required in TINCAN ISLAND. Import Licence process in PORT HARCOURT . Process to import to LAGOS. Requirements of registration to import to APAPA. Registration requirements in Sokoto to import. Registration needed to import to Enuguf. How can I register to import in TINCAN ISLAND. What Licence requited to import in Port Harcourt. What should I do to import goods in Calabar.